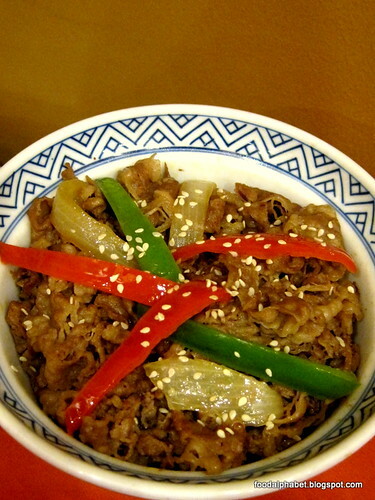 The Food Alphabet and More: New Yoshinoya treats to enjoy! 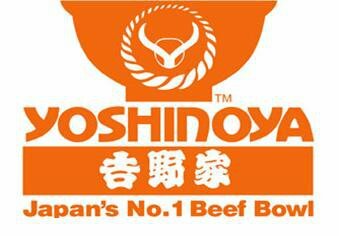 Yoshinoya, Japan's No.1 Beef Bowl, is making waves here in the Philippines with their new line up of Japanese food treats that will surely fill up your tummy and give you a big smile. 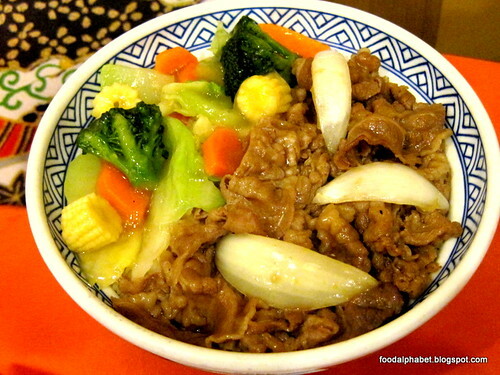 New to your favorite Japanese Beef bowl are more choices and more ways to enjoy Yoshinoya! Here we have Japanese Rice bowls, Tokyo bowls, Tempura bowls and Rice bowls. Tender slices of beef simmered with fresh sliced onions in a special broth of herbs and spices with a mix of vegetables on a bed of steaming white rice, the sauteed vegetables complimented the beef slices well, as it balances the saltiness of the dish and gives you a lighter taste. Next we have Tokyo Bowls! 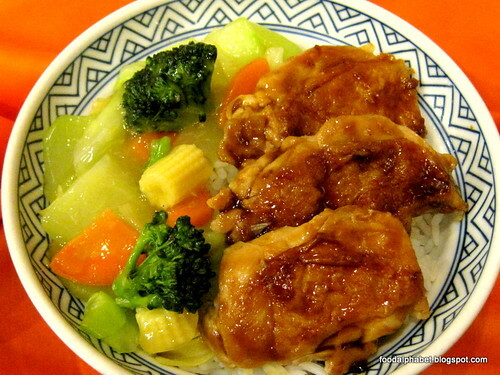 Grilled to perfection, chicken marinated in a ginger-infused sauce served with mixed vegetables, is a great addition to their Tokyo bowls as it reaches out to the people who don't regularly eat beef offering them an alternative dish to enjoy. Beef slices with onions, garnished with sesame seeds and capsicum slices over steaming white rice, giving you that spiced scent, bringing out the flavor in every bite. 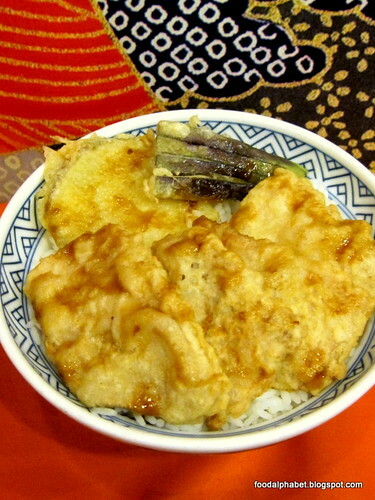 Pork fillet breaded with sweet potato and eggplant as sides, over steaming white rice drizzled with special tendon sauce, though we don't usually have pork tempura on most Japanese restaurants and fast foods, this is something you should try and appreciate as well, bring out the adventurist in you. 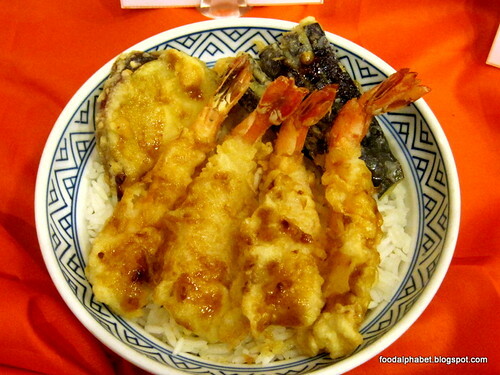 Crispy golden brown white prawn and deep fried sweet potato and eggplant spread over with special tendon sauce, Also available is their Chicken tempura bowl (P159), my favorite by far as I am a tempura fanatic, the added eggplant and sweet potato gives you more of the fulfilling lunch you would want to have everyday before getting back to work. 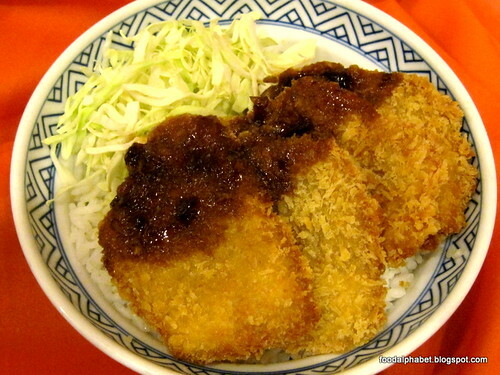 Deep fried breaded pork fillet topped with special tonkatsu sauce with cabbage on the side and white rice at the bottom. Tonkatsu, need I say more! Crispy and tasty with every bite. 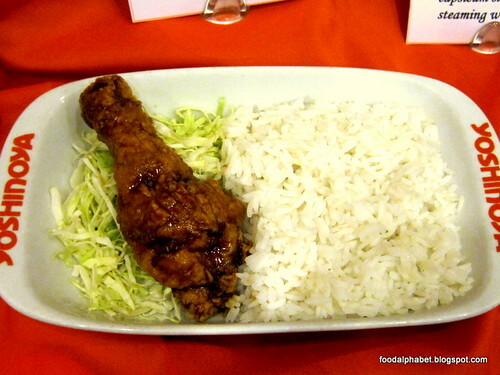 Deep fried, double-coated marinated chicken, dipped in a special sauce over steamed rice. Double the goodness and flavor of Yoshi's chicken serving with double-coated marinated chicken. This will have you running for your money, this is worth every buck you spend, as much care and attention has been given to Yoshi's chicken, giving you the chicken experience only Yoshinoya can give.